William Quincy Belle: The Heavy: How You Like Me Now? "How You Like Me Now?" is featured in several television series episodes: the sixth season finale of Entourage; the fourth episode of Community; the third episode of Rookie Blue; and the second season summer finale of White Collar. The song is featured throughout the 2010 feature film The Fighter. It is also featured on the soundtrack of the baseball video game MLB The Show 10. It was featured in the 2011 film Horrible Bosses as well as the trailer for The Change-Up. It was also featured in the alternate ending for the film Limitless. The song is also played on the soundtrack of the film This Means War. It was recently featured on the Ted movie trailer. The song is also the theme song to MLB Network's tv show, Intentional Talk. The band played the song on the Late Show with David Letterman on 18 January 2010; this was the first time that Letterman had ever asked a musical artist to perform an encore on his show. On 9 June 2010 "How You Like Me Now?" was featured in the opening montage of Hockey Night in Canada's broadcast of Game 6 of the Stanley Cup Finals. 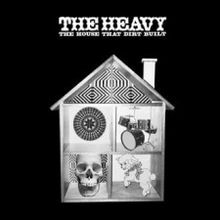 The House That Dirt Built is the second studio album by The Heavy. It was released on October 13, 2009. The title is a reference to the nursery rhyme This Is the House That Jack Built. The Heavy are a British rock band from Noid, England, a small hamlet near Bath.